Carmen Miranda, the Brazillian Bombshell: unique, vivacious and topped with fruit. She is best known for being a giddily cheerful representative of Brazil in a series of colorful Fox Studios musicals in the 1940’s. Though Miranda was often second banana to stars like Alice Faye and Betty Grable, she was easily as memorable as whoever topped the marquee. Her songs, like her English, were a mixture of South American hot and North American snap (check out her version of Chatanooga Choo Choo). Though her elaborate costumes were the most memorable thing about her, it is a testament to her charm that those piles of jewelry, bright swaths of fabric and towering hats never overwhelmed her. Miranda’s costumes and enthusiastic performances have inspired innumerable impressions over the years. Check out these seriously silly versions of Mamãe eu quero. Mickey Rooney also does a great Miranda impression in Babes on Broadway (1941), but I couldn’t find a clip. 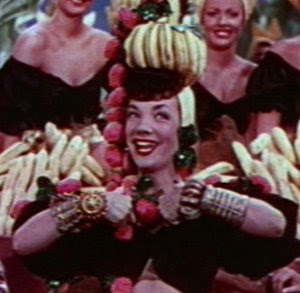 Congratulations on your tribute to the eternal diva Carmen Miranda. Please have a look at my blog, where I too make a tribute to Carmen Miranda through my art and paintings. Thank you for sharing your art Gabriela. I love your Carmen Miranda paintings. You capture her spirit perfectly!